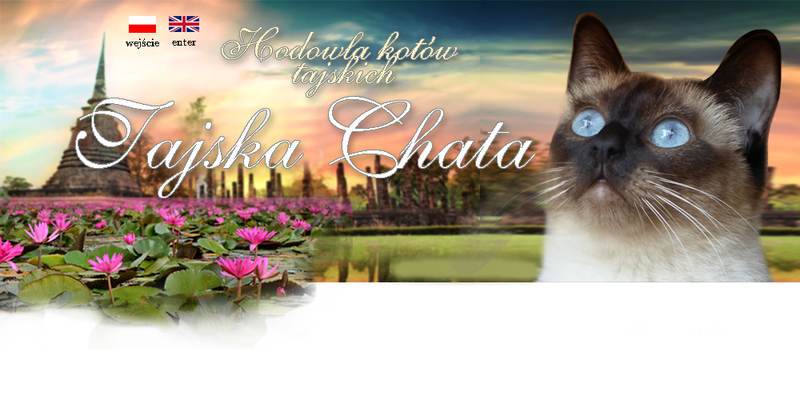 THAI CAT (old-style Siamese) – is a descendent of a Siamese cat breed. A royal Siamese cat was brought to Europe at the end of the 19th century. Some cats were precious gifts to the British ministers from the king of Thailand, whilst others were simply stolen from the palaces by European explorers. The first references to white cats with black ears, paws and tails date back to the 14th century. Then “Cat poems” were written, which at present can be seen in the National Library in Bangkok. Manuscripts with verses and drawings mention fair-coloured cats with contrasting dark markings. There have always been numerous legends and myths about royal cats (as the predecessors of Thai cats used to be called). It is believed that members of royal families and monks from Buddhist temples had those cats. Those cats were protected against strangers as the blue-eyed cats were believed to have warded off evil spirits, protected the household and cleared it from evil. They are also known to have protected royal palaces, temples and libraries against mice, rats and snakes – they were bowed to as protectors of temples and souls of the dead (according to the legend, Siamese cats received the soul of their owners upon the owner’s death). It was also believed that a fair-coloured, blue-eyed cat attracts silver, therefore, the person owning many such cats would have a lot of silver as well. In ancient Siam, when the rainy season was coming, royal cats were moved to the houses of their owners. Each owner sprinkled the head of the cat with water so that the long-awaited rain arrived. In the 1950s, the cat that is nowadays known as Thai was called a Siamese cat. Over the years the Siamese cat breed was changing. The cats became more slender, with wedge-shaped heads and more closely set eyes. At the beginning of the 1990s, the breed with the classic look of the old-Siamese cats was revived. In order to differentiate it from Siamese cats, the breed was called Thai. An ideal Thai cat is of medium frame - weighing from 3 to 5 kg (females are smaller than males), muscular but elegant in movement, of silky fur, a round head, blue eyes, , medium-sized ears and fur in different colours. Thai cat’s eyes should be intensively blue and almond-shaped. The contrast between the fur colour and point markings on head, ears, paws and tail is of crucial importance. Darker spots on the body, especially the belly and lighter spots on dark markings are unacceptable. At present there is a wide range of colouring variations. Thai cats apart from classical seal-point colouring might have the following colourings: blue-point, lilac-point, chocolate-point, caramel-point, taupe-point, cinnamon-point, cream-point. Some colours are very rare. All the colours might be either lynx (tabby) or tortie. The colour of the nose and pads depends on colouring and influences the colouring. THAI CATS are very friendly, calm and unobtrusive. They like children and are very dedicated. The cats participate in the family life but are unobtrusive. They observe everything; they are unafraid of visitors, greet them with interest after a while. They dislike being alone, form a great bond with their owners. Thai cat is a great companion and friend. The moment he appears in the house, he becomes the apple of everybody’s eye.